And the name on the heart was Viviana Adams! 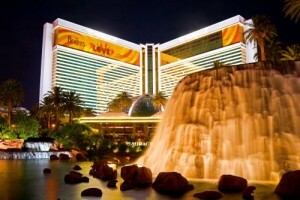 Congratulations… your hard day ends with two fabulous nights in Las Vegas at the Mirage Hotel and Casino! Your Vegas escape includes two tickets to see The Beatles LOVE Cirque du Soleil, dinner for two at the Mirage, VIP gift bags, and flights there and back. Michelle :: Firstly. 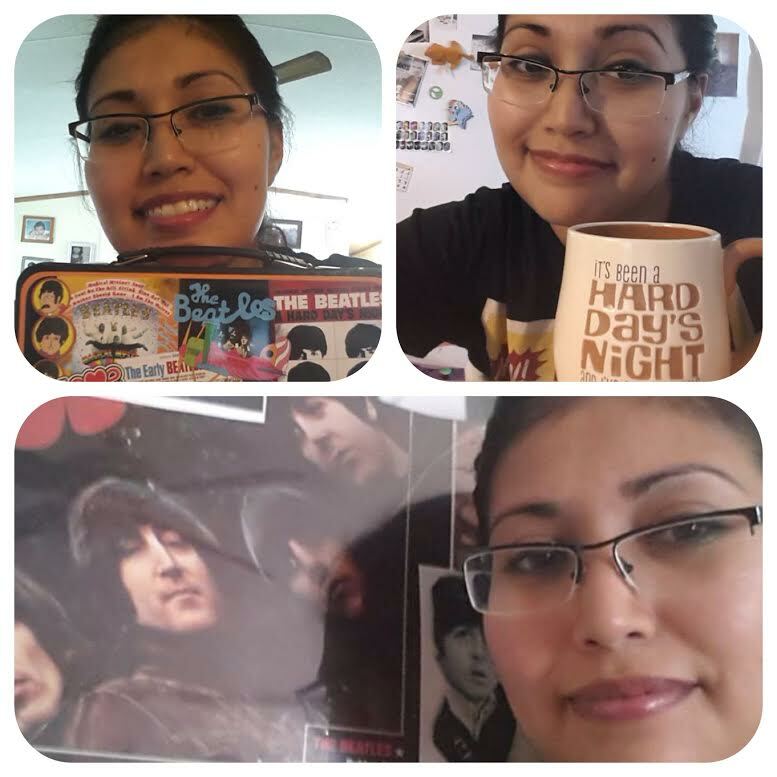 Can you send some Beatles selfies and a note to the fans to post when we announce your win? Viviana :: Thank you so much for the prize, I’ve never won anything like this! I am so thrilled I am still so excited. Thank you so much, I can’t wait. Michelle :: Yay! When did you first fall in love with The Beatles? Viviana :: The first time I fell in love I was 15. I saw the Beatles Anthology and was so amazed by them and how hard they worked, and how they stayed true to themselves. They were not afraid to try something new. The music was amazing! I had heard it before when I was a little younger and my mother played it. Listening to their music it felt like I found…home. A place were I belong. Michelle :: Wow! That is beautiful. So, have you ever been to Vegas or seen the LOVE show before? Viviana :: No, but I have the LOVE show on DVD! Michelle :: So cool! How many times have you watched it? Like, once – or a lot? Viviana :: a lot LOL. Yay!!! And we are still chatting. I’ll add more here if she says anything else awesome and I suspect she will. I love telling people they just won a trip to Vegas. It’s one of my favorite parts of my job! The bearer of the best. news. ever. I’m so excited. I should make a Beatles LOVE Cirque du Soleil Hall of Fame with all our groovy winners! Yes, I will do that. Viviana is our eighth winner, which makes kinda makes me wish her name was Henry. Peter Noone would have gotten a kick out of that one! Thank you to the team at LOVE Cirque du Soleil and the Mirage for making this possible, and making so many people feel the perpetual love of The Beatles in such a magical, spellbinding way. Next stop Los Angeles — our next winner gets picked Sunday at the LA Fest – October 12th. You don’t have to be there to win but you won’t regret it if you are!!! 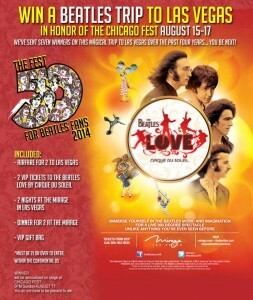 Stay tuned for yet another chance to win the Beatles LOVE trip to Las Vegas! Chicago FEST is only 9 days away and we are thrilled to once again offer a lucky winner and guest a Las Vegas Beatles Getaway they will never forget! 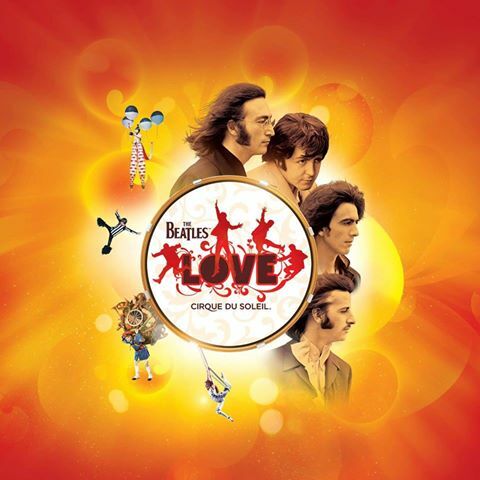 This is our third year working with Cirque du Soleil, and for all of you who have seen The Beatles LOVE show, you know how breathtaking and fabulous it is. It only takes a minute to enter. Please Note: The Tweet with entry is optional for 2 extra entries – if you don’t do Twitter, simply delete the text in the Tweet box. You may enter once a day until August 11th and you can also score extra entries by sharing with your friends. The winner of the first trip was actually in the ballroom of the Hyatt Regency O’Hare when her name was called. We have never heard such a loud scream. Last year, she came on stage to talk of her amazing experience. You do not have to be present to win and it is open to anyone in the continental U.S. 21 years or older. 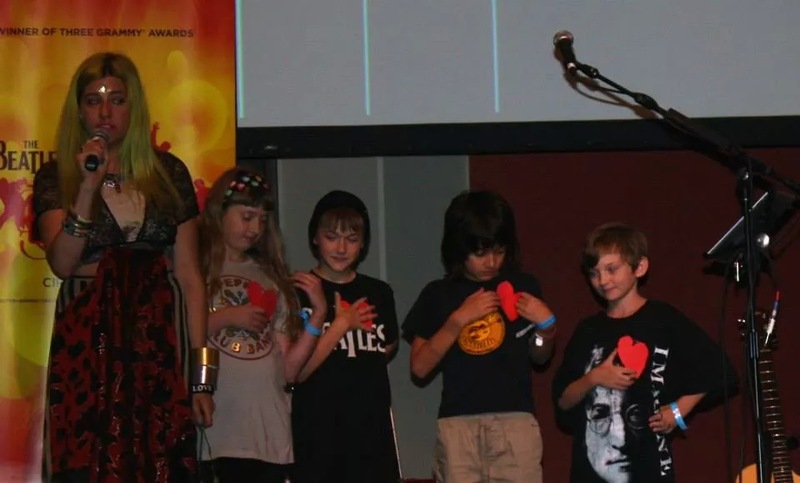 If you watch The Fest online you can watch Michelle announce the winner’s name. It can’t be you if you don’t enter!! !